"Rasta Barbie", "Mocha-hontas"--all of the cliché names, I've been referring to myself as since I've put these Marley twists in my hair. I love them!! And it only took me 2-3 hours to put them in. Yea, they are a bit sloppy, in my opinion, but this was my first time, so I'm not to concerned. I'm just happy to be taking a breather from doing my hair. 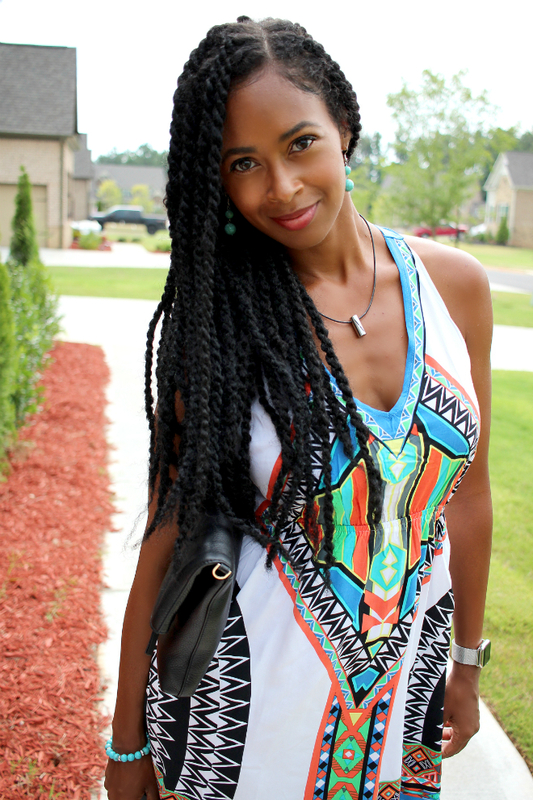 In this post, I'm wearing this white tribal print dress, I currently have stocked in my store. I wore it on Saturday for a "date day" with the hubs. We went to one of Atlanta's local breweries, Orpheus Brewing--went on the brewery tour and sampled some beer. It's also Atlanta Downtown Restaurant Week, so we tried out a new downtown area restaurant, as well. I will be doing a separate post on that restaurant later in the week. This dress is one of my favorite dresses in the store. It's super light and air-y (which is great for this record-breaking heat), without being see-through. Of course, the strappy back is the cherry on top. I have limited quantities, so get it while you can! You are ridiculously gorgeous! Your hair, your makeup, the dress, all so flawless! Rasta Barbie is the most accurate. You look gorgeous lady. ummmm, GORGEOUS!! This dress is so pretty and it looks amazing on you! !